What better way to express your love of candy than with candy-themed furniture? Our friends at Jellio are at it again, busy working on a candy button bench (see below) – which looks suspiciously like a strip of candy buttons. 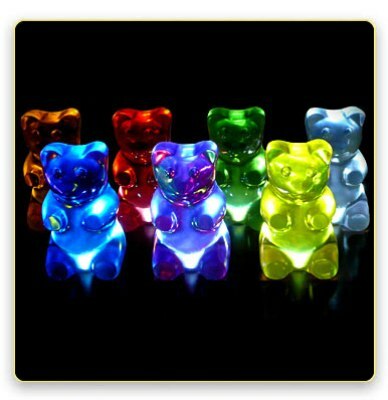 Previously we wrote about their GummiLights range of lamps – they look like giant gummy bears but light up at night via small LEDs “in their butts.” Now available in seven colors, you can buy them individually or as a set of five. The candy dork in me totally loves the things these guys come up with. All their furniture is based on images or items from childhood pursuits – from the Cupcake Seat to the Lite Table. They’ve also got a Candy Table – which unfortunately isn’t filled with candy (break glass for emergencies?) but instead with loads of plastic squirt guns. ummmmm… Who was the marketing manager for the light up gummy bear lights? They come in SEVEN colors but you can buy them as a group of FIVE???? oh – the other thing is – they just added blue and purple so the 5-pack deal probably hasn’t been updated with the two new colors. Oh my god. I have to (if they were free) get one for my sister. She loves FROZEN gummi bears. Oh my goodness I just love these things. I am a big candy fan and it is probably the only reason that I have trouble losing this extra baggage called weight. Thank you for posting this stuff it is just great. That is just cool. My daughter would get a kick out of having that for her bedroom. Whoever came up with that design has an ‘A’. Very cool. Oh my goodness! I just love the GummiLights! What a wonderful idea. Who come up with these ideas is beyond me. At first I thought they would be perfect for my son, but then I thought, what a wonderful whimsical accent it would be to add to our family room decor. I just may have to add this to my Xmas list!